Property Tax Reform in Developing Countries provides a conceptual framework for property tax reform with the intention of making the most compelling argument possible to persuade the reader as to its validity. The text claims that a model for property tax reform in developing countries is derived from a theoretical distillation of empirical experience. The primary objective of this study is to establish, through logic, theory and observation: what constitutes a good property tax system, for whom, and under what conditions; why such a system works; and how inferior systems can be upgraded to approximate well-functioning systems. Property Tax Reform in Developing Countries develops its examination in three stages. First, a conceptual framework is presented for the formulation, implementation, and evaluation of property tax reform in developing countries. 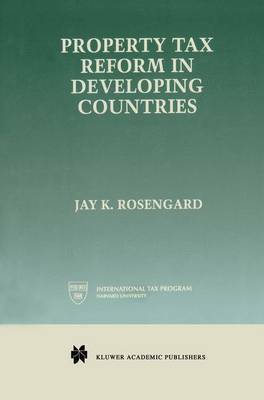 Second, attempts to reform property taxation in four developing countries are examined in detail. Finally, the results of the reform efforts described in the four case studies are evaluated and guidelines for reform are offered. The study concludes with specific recommendations for reforming property tax systems in developing countries, based on the conceptual framework and synthesizing lessons of the case studies.